A post about biking with the trailer is in the works, but the truth is, even before last week’s snow and the resulting icy roads, Gabriel and I have been sticking closer to home, with more outings by foot. That, and quite a lot of car outings for family time over the holidays. Last Friday, we walked through a pretty snowfall for a family pizza dinner outing. Not amazing pizza, but good, with a nice atmosphere, and the whole being able to walk there makes it taste better thing going. Thus far, we’ve been pretty minimalist with Gabriel’s footwear — barefoot or socks (no shoes) exclusively for the first year. While we were mired in indecision (and Gabriel got closer to walking), trying to find a balance between good shoes that would actually be foot shaped and healthy for his feet and not spending an unreasonable amount of money for shoes that he would outgrow in a few months, my MIL bought a pair of Skidders (I’ve also seen them called Rubberoos). Foot-shaped, flexible, easy to wear, they’re a kind of hybrid sock-shoe: sock-like fabric top with a thin, flexible, grippy rubber bottom. They’ve been great for the past few months, and Sir logged some serious miles in them, between walks with me and with his grandpa (up to a half mile! ), but they’re not so good for walking outside in wet/cold/snowy conditions. Though I liked the design of some of the Keen infant/toddler boots, I couldn’t bring myself to drop eighty dollars or more on a pair, so last week (just in time for the snow), I compromised on an okay-for-not-to-frequent-wear pair of snow boots at a kids’ consignment store. Gabriel had to relearn walking with the new kicks, but he picked it up fairly quickly. On NewYear’s day, we hit the slopes. Luckily, the park at the end of our street has a decent little hill. 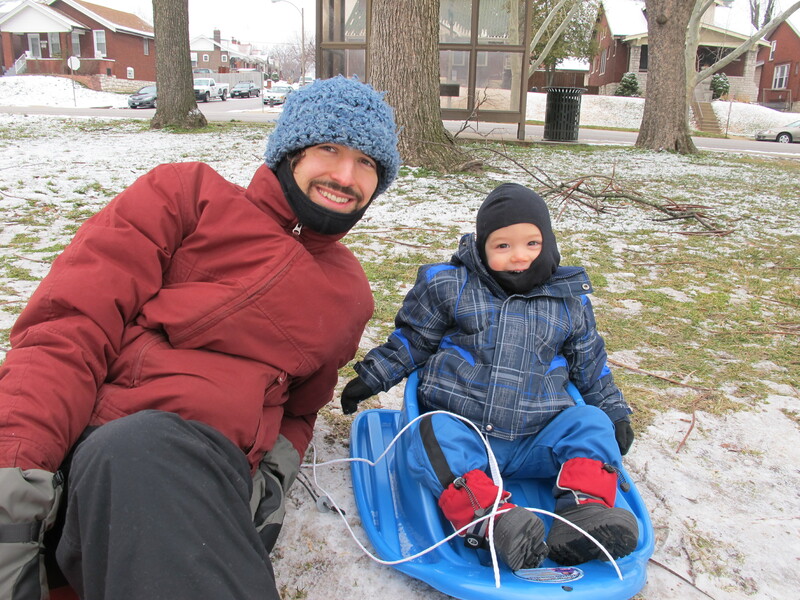 Walkable sledding hill equals not having to navigate iffy streets in the car, a definite win. Yes, there may have been as much grass as snow on some parts of the hill, but we take what we can get. 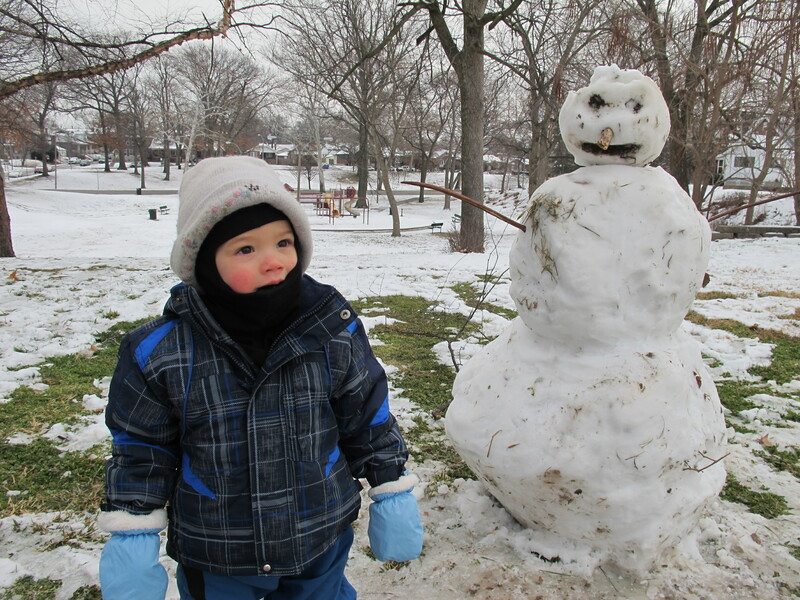 It’s been chilly (by StL standards) since the snow, and I’ve been in hibernation mode, but time outside is unarguably good for Gabriel (and probably good for me too), so we bundled up yesterday morning and ran some errands on foot, picking up a shoe repair and ducking into Home Eco. We stuck to the sunny, non-icy side of the street, and Gabriel covered some serious distance before accepting a lift in the stroller. Even in our not-super-cold temps (high teens, low twenties, may feel colder with wind), the right gear — warm footwear, good mittens, and, yes, balaclavas — make outside time much nicer. An added bonus of the balaclavas — we’re ready to rob banks at the drop of a hat . . .
. . . or ready to encounter slightly sinister looking snowmen. Happy winter! This entry was posted in Biking, Health and tagged active transportation, walking. Bookmark the permalink. I like how staying local/walkable with young kids lets them explore a “big world” and lets parents appreciate the little things nearby! Yes, I’m planning another post on the topic, but it’s clear that Gabriel’s really getting to know his ‘hood, which is fun.